With recent reports clearly showing the beginning of housing market recovery, I was curious to assess the impact on Tallahassee REALTOR production. Back in 2009, the average REALTOR in Tallahassee was selling just three homes per year, which means their average earnings was below the poverty line. 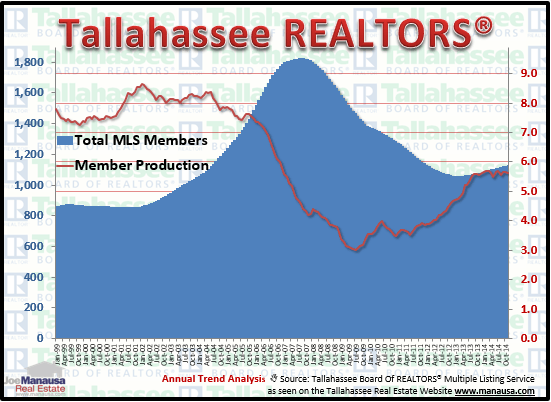 The graph above shows that the average production for a Tallahassee REALTOR has risen from 3.0 in the Summer of 2009 to just below 5.0 after the first quarter of 2013. Of course, many people in real estate just work part time, so they are not necessarily trying to make a living selling homes. Would you be surprised to know that 87% of REALTORS do not even sell a home each month? Regardless, consumer confidence in real estate professionals is still near an all-time high. The real estate graph above measures home sales in Tallahassee (the one year average monthly trend). The red area represents all home sales recorded in Leon County, while the logo-filled area represents the sub-set of all sales which are recorded by a Tallahassee REALTOR. The corresponding yellow line shows the percentage of home sales that are recorded in the Tallahassee MLS, or what we refer to as the MLS share of the market. Of course, not all REALTOR sales go into the Tallahassee MLS, but most do. So with 87% of REALTORS in Tallahassee selling very few houses, can you see why it matters which real estate company that you hire? It's not enough that you pick a great real estate agent, if that agent belongs to a company with a lot of part-timers, it will diminish the effort that you receive. Why? Because even at the best-run companies, new buyer calls are not 100% captured by the best-trained agent in the office. So if an office has a lot of dead weight, the "perfect buyer" for your home could call in and be assigned to somebody who won't even sell a home this year. Ouch for you! Here are 7 articles that I have written about finding the best agent to sell your home. If you take the time to read each one, then you will likely get the top dollar for your home next time you sell. I hope by reading these articles you feel better prepared to sell your home. If you are not careful, you could end up with the agent in the video below! I hope you gained some insight on choosing the best Tallahassee REALTOR for the job of selling your home, and please drop me a note if there is something more specific you would like to know about hiring a real estate professional.